Here is a great example of how the government regulations do not take into account the needs of those whom they are trying to protect. As you may or may not know, Title III of the ADA effects places of public accommodation, basically businesses. For your average small business owner, this is too much information — no one running a small businesses has time to shift through this level of legal-ese. And yet they are effected because these regulations are for protecting the rights of your customers. Basically the revised Title III states defines service animals as dogs. This ignores the fact that service animals do different things for people with disabilities — not just for the blind. For instance, with epileptics, service animals help their owners in time of seizure. They are trained for specific tasks. Here is a great link about this topic: Service Animals RE: Epilepsy. There has also been plenty of debate as to whether dogs are the best animal to service the blind. In any case, this revision, for business owners, makes it easier for a business owner to spot whether someone has a ‘service animal’ or not. But it will cause consternation among disabled individuals with service animals who are not dogs — when they are denied entrance and probably bring about a few lawsuits between disabled individuals against businesses who deny them entrance. This is not a good thing. Eventually, this law will be revised again to have a broader scope than defining a service animal as a dog — simply because this definition is not effective. This will probably mean that businesses and organizations who learn about the original revision and change their policy will have to learn about the newer revision and CHANGE THEIR POLICY AGAIN. It’s very possible that individuals in the government put this definition in place simply to 1) avoid further unfocused discussions as to what a service animal was 2) simply to have a revision in place which can later be re-tooled to be “on target”. In large organizations it’s often better to have an approximate policy in place to close the discussion than to go through the extra process of debate and risk losing having any policy at all. Eventually that kind of policy will be “cleaned up” through a more focused study with the framework of the approximate policy in place. Do any of you know what this kind of process is called? It’s something that I have observed happening but no one seems to be able to have a term for it. In any case, since the revised Title III is long, for your ease, quoted below is the relevant text. Service animal means any dog that is individually trained to do work or perform tasks for the benefit of an individual with a disability, including a physical, sensory, psychiatric, intellectual, or other mental disability. Other species of animals, whether wild or domestic, trained or untrained, are not service animals for the purposes of this definition. The work or tasks performed by a service animal must be directly related to the handler´s disability. Examples of work or tasks include, but are not limited to, assisting individuals who are blind or have low vision with navigation and other tasks, alerting individuals who are deaf or hard of hearing to the presence of people or sounds, providing non-violent protection or rescue work, pulling a wheelchair, assisting an individual during a seizure, alerting individuals to the presence of allergens, retrieving items such as medicine or the telephone, providing physical support and assistance with balance and stability to individuals with mobility disabilities, and helping persons with psychiatric and neurological disabilities by preventing or interrupting impulsive or destructive behaviors. The crime deterrent effects of an animal´s presence and the provision of emotional support, well-being, comfort, or companionship do not constitute work or tasks for the purposes of this definition. You can glance further down and see that miniature horses were considered as service animals, there is a section about them. Nonetheless, comparing this text with the definition above, you can see how businesses can be confused by this contradiction or not understand in depth enough what a service animal is — prompting all kinds of hostile feelings, disagreements and lawsuits. (1) General. Generally, a public accommodation shall modify policies, practices, or procedures to permit the use of a service animal by an individual with a disability. (ii) The animal is not housebroken. (3) If an animal is properly excluded. If a public accommodation properly excludes a service animal under § 36.302(c)(2), it shall give the individual with a disability the opportunity to obtain goods, services, and accommodations without having the service animal on the premises. (4) Animal under handler´s control. A service animal shall be under the control of its handler. A service animal shall have a harness, leash, or other tether, unless either the handler is unable because of a disability to use a harness, leash, or other tether, or the use of a harness, leash, or other tether would interfere with the service animal´s safe, effective performance of work or tasks, in which case the service animal must be otherwise under the handler´s control (e.g., voice control, signals, or other effective means). (5) Care or supervision. A public accommodation is not responsible for the care or supervision of a service animal. (6) Inquiries. A public accommodation shall not ask about the nature or extent of a person´s disability, but may make two inquiries to determine whether an animal qualifies as a service animal. A public accommodation may ask if the animal is required because of a disability and what work or task the animal has been trained to perform. A public accommodation shall not require documentation, such as proof that the animal has been certified, trained, or licensed as a service animal. Generally, a public accommodation may not make these inquiries about a service animal when it is readily apparent that an animal is trained to do work or perform tasks for an individual with a disability (e.g., the dog is observed guiding an individual who is blind or has low vision, pulling a person´s wheelchair, or providing assistance with stability or balance to an individual with an observable mobility disability). (7) Access to areas of a public accommodation. Individuals with disabilities shall be permitted to be accompanied by their service animals in all areas of a place of public accommodation where members of the public, program participants, clients, customers, patrons, or invitees, as relevant, are allowed to go. (8) Surcharges. A public accommodation shall not ask or require an individual with a disability to pay a surcharge, even if people accompanied by pets are required to pay fees, or to comply with other requirements generally not applicable to people without pets. If a public accommodation normally charges individuals for the damage they cause, an individual with a disability may be charged for damage caused by his or her service animal. (i) A public accommodation shall make reasonable modifications in policies, practices, or procedures to permit the use of a miniature horse by an individual with a disability if the miniature horse has been individually trained to do work or perform tasks for the benefit of the individual with a disability. (D) Whether the miniature horse´s presence in a specific facility compromises legitimate safety requirements that are necessary for safe operation. (iii) Other requirements. Sections 36.302(c)(3) through (c)(8), which apply to service animals, shall also apply to miniature horses. Before I end this post, there are two general questions businesses always ask us. 1). How do I know whether someone has a service animal has a service animal and 2) Can I charge them more for bringing this animal in? And NO, businesses cannot charge the individual with a disability MORE (even if you can charge pets more) because service animals are not pets. If the service animal causes damage, then the owner is responsible for paying for that damage. You can look at the Title III’s full regulations here: Title III Revised Regulations. Being educated is the first step to any kind of compliance. Unfortunately, there are TONS of regulations. Thats why we are around, to help you become educated about what you need to know. Starting the new year (2011) on the right foot is a great way to help set the tone for the new year. So we at YTA have decided that the best way to do that is to help all you out there notice a few of the conflicts between State and Federal Law. The state in question, of course, is California. While the CBC never allows a maximum slope of over 8.33% (1:12) the ADA has allowances for steeper slopes if the slope rises less than 3 inches the maximum slope is 12.5% (1:8). If the rise is 6 inches the maximum slope lowers to 10% (1:10). Ramps runs under the CBC can only rise to a maximum of 30 inches per run but as the length of the ramp run increases, the maximum slope decreases. E.g., a ramp run that is 465 inches long cannot have a slope greater than 6.67% (1:15). The ADA always requires a clear floor space of 18 inches square directly under each door sign whereas the CBC only requires clear floor space based on the latch side clearances for each door. The CBC requires that employee parking include parking spaces reserved for the disabled. For the CBC, the total ratio of disabled parking spaces must include employee spaces. The Advisory for the ADA states that employee parking lots are not required to be included in the required ratio of disabled parking. The ADA allows the door closer to swing into the head clearance down to 78 inches. The CBC does not allow the door closer to drop less than 80 inches. While both the ADA and the CBC now have requirements for a maximum mirror height of 35 inches for mirrors not over sinks in restrooms, the ADA advisory states that the top edge of stand alone mirrors should be no less than 74 inches above the finished floor. The CBC requires that disabled parking spaces reserved for vans should always have the access aisle on the passenger side (when the van is pulling forward). The ADA allows the access aisle to be on either side of the space except when the parking space is angled. Angled van parking spaces are required to have the access aisle on the passenger side. Parking space signs for the CBC must be at least 80 inches above the parking grade when in the path of travel. ADA parking signs must always be at least 60 inches above the parking grade. For the ADA, grab bars in restrooms can be anywhere from 33 to 36 inches measured to the top above the finish floor. In the CBC must be exactly 33 inches on center above the finished floor, unless you are using a tank toilet and the rear bar interferes with the tank’s lid. If that’s the case then the CBC allows the rear bar to be anywhere from 33 to 36 inches on center. These are just some of the conflicts between the CBC and the ADA. Negotiating these code requirements requires intimate knowledge about both the INTENT of the law and the explicit details surrounding the requirements. Hiring an experienced Access Consultant is a must! Should you have any questions, please email Yours Truly Accessibility Corporation at help@accesssolutionllc.com or call us 866-982-3212 x 1. The modification of the Department of Justice’s ADA for 2010 and the introduction of the new California Building Code of 2010 effective as of Jan 1, 2011 has given all of us a pause. But that’s our issue and not yours. Keeping on top of accessibility issues is a full time job, but that’s why we are here. Of some interest to many of you may be forth coming issues with accessibility. The Department of Justice has been busy with new legislation seeking to more solidly define the scoping requirements for access for the disabled. This has been long in coming. People with special needs have special needs — and it’s hard for many of us, even those of us in the health industry to understand what it’s actually like to have needs different from your average patient. The health industry has been very slow to adapt to 21st century standards when it comes to providing adequate health care for the disabled. Often times, health care facilities may not have a gurney for disabled patients — those that do often don’t have staff who know how to use a gurney or how to treat a patient. This can endanger a patient’s life, making for an uncomfortable situation where a patient may find themselves in the hands of staff who don’t know how to treat them. No one wants to feel like they are a piece of meat, or to lose control over how or where they can be taken. I write this by way of example. Here is a webpage: Notice of Advanced Hearings on Proposed Rulings. What’s significant about putting this online is that often you business owners out there, complain that you don’t get a say in these laws. They get passed and you don’t know about them or who decided these issues. I think many business owners think that a bunch of disabled people sit around with law makers and try and make trouble for business owners. This isn’t true, these discussions need to be balanced. Many disabled individuals are as much ‘in the dark’ as your common business administrator about these things. That’s why these discussions are public. Everyone involved needs to come to the table. It’s so important to not forget: what your business means to others is as important as what others mean to your business. It didn’t take long to figure out why a man in a wheelchair had been snapping photographs of the aisles, counters, shelves and bathrooms inside eateries and watering holes in a fashionable eastern Long Beach enclave. On June 30, Powell’s Sweet Shoppe; Open Sesame, a Lebanese restaurant; and Panama Joe’s Grill & Cantina were served with lawsuits on behalf of Eric Moran alleging that they were in violation of the Americans With Disabilities Act. The violations, each of which could cost a minimum $4,000 in damages, ranged from lacking a restroom grab bar to a restaurant chair out in an aisle. For updated information on ADA legislation look at California Chamber’s ADA Reform page. Also read more about CASp consultants. The new federal standards for the Americans with Disabilities Act was signed into law by Obama yesterday on the 20th Anniversary of the signing of the ADA by the first George Bush. You can also read the updated guidelines as they apply to the older regulations. Basically the ANSI/IBC standards of 2004 which incorporated the ADAAG 2004 have been absorbed into the Revised Standards of 2010. Facilities which are going to undergo construction 18 months from this date need to comply with the 2010 standards IF they have not yet complied with the 1991 standards. You can see the text directly below. Many of the 2010 requirements are stricter. A major difference is that the 1991 requirement for van accessible space be 1 for every 8 total accessible spaces has changed to 1 for every 6. Another difference is the increase of space required for a side transfer in a single user toilet stall from 3 feet to 5 feet. These new standards reinforce, add or revoke existing 1991 standards. If you are thinking of updating to these new standards, you may not have to. There is a short window for businesses to comply to the 1991 standards before the 2010 take effect. Where the 2010 standards revoke the 1991 standards we can point those out to save you the time and effort of complying to standards which will no longer be necessary. We can help you navigate these and more. If you have any questions, of course feel free to email us at help@accesssolutionllc.com or call our toll free number at 866-982-3212×2. 20 Years of Americans with Disabilities Act! We need to have large numbers of people with and without disabilities involved in this campaign. Getting involved is easy. Let’s all join together and show the world how large this community is and that it is time we are members of every community. Other than the slopes and cross slopes? What else is improper about where this parking is located? Hint: A truly accessible parking lot isn’t just about striping blue paint according to the correct dimensions. For accessible parking spaces, there needs to be a “bridge” to the accessible entrance and a protective “envelope” around the patron along this path. If you can imagine the asphalt as an ‘ocean’, one that is hazardous to someone in a wheelchair (who can be completely invisible to a driver backing out of a parking spot because of their low profile), you will realize the necessity of protecting the disabled patron with this path of travel. Creating an accessible path can include various configurations of head aisles, cross walks, detectable warnings, edge protection and signage (not to mention addressing various hazards like grates or protruding objects). This becomes even more problematic when an owner or a designer does not understand the principle or reasoning behind the elements of an accessible path. This is because while the ADA guidelines specify only certain drawings as an example, there are invariably several possible solutions depending on the unique characteristics of each facility. The worst situations are where accessible parking is added where there is room for one feature (say an access aisle) but this is done without regard to where the main entrance is located, and a disabled patron must unnecessarily travel over twice or three times the distance that an able-bodied patron can travel to reach the entrance of a store. This is where having the right consultant becomes so important. Knowing what your options are can save a ton of money and time while preventing confusing and even dangerous travel for a disabled individual. Accessibility is more about fair access to goods and services than it is about construction. Elements along an accessible route need to comply with existing design standards, but as long as the good or service is made accessible with reasonable accommodation, construction might not be needed. The requirements of the ADA are many, but they are such that in the big picture, there are almost always alternate options available. Furthermore, designers, contractors and inspectors don’t have control over how a building is used or what is offered within a building… that’s up to the occupant. If the occupant assumes that access is all about building code, as many often do, they may think they don’t have any responsibility when in fact their lack of awareness leaves them open to all kinds of liability. A restaurant owner may think that an upstairs dining room is perfect for private parties or events. But what if a customer books a wedding at your location and it turns out that their grandma is in a wheelchair? Does this mean she can’t see her grandchildren during dinner? Providing equal (or equivalent) access is paramount, and where we choose to locate accommodations becomes a deciding factor in how an occupant configures a space. Unfortunately, there are few classes to teach business owners or commercial real estate agents the complex requirements for accessibility. So, YTA is here to help. If you have any questions of concerns about accessibility, feel free to give us a call at (866) 982-3212 or email us at help@accesssolutionllc.com and we can consult with you to determine your full accessibility needs or even hold seminars for your organization or community. *Note: The California Building Code may have changed its requirements since the writing of this article. Two large changes loom in the horizon for disability access in California. President-Elect Barack Obama plans to start a Disability Department to help integrate disabled Americans into mainstream society. Currently, a large number of Americans who have disabilities are barred from attending educational institutions or seeking employment with small businesses because 1) disabled Americans stand to potentially lose their government funding if they enter the work force and 2) small businesses can’t offer the comprehensive health care coverage that the disabled often need. Obama intends to change all this. His comprehensive plans include providing incentives for businesses to hire the disabled, incentives for businesses to provide increased health-care coverage and to fully fund the Disabilities Education Act. 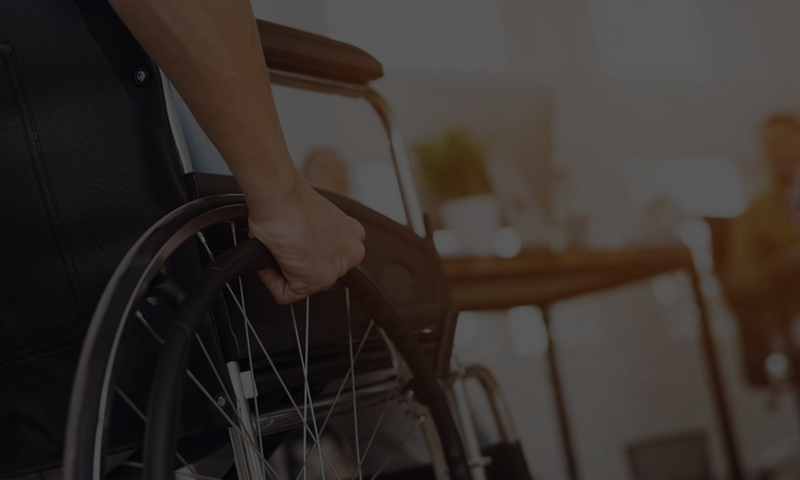 Combined with the ADA Amendment Act of 2008 which expands the definition of who is legally considered disabled, we can all expect a greater level of scrutiny applied to disabilities in general. With more disabled citizens out on the streets, going to school, going to work, and going out to lunch, there will be an definite increase in the need for public access on all walks of life. The second change comes from the state level. Recently, Governor Schwarzenegger and the California State Assembly passed S.B. 1608, which is meant to curtail frivolous lawsuits and encourage business owners to make their buildings accessible. S.B. 1608 also has provisions for requiring cities and building departments to retain accessibility experts in order to ensure that the city become and maintain its accessible features. For those leasing or thinking about leasing, accessibility inspections become even more imperative. Instead of inheriting a building full of accessibility barriers, many business owners and landlords are taking the extra step to comply with the ADA. However, incomplete knowledge can give a false sense of security that still leaves your business open to a lawsuit. For example, did you know that under California and Federal Law you need two signs for the restroom door? Or that the accessible parking space must be on a level surface closest to the main entrance? That’s why more and more businesses are turning to professional accessibility consultants before opening their doors. Protect yourself by requesting an accessibility assessment today. For questions, call Yours Truly Accessibility at (866) 982-3212.